A group was incorporated on June 5th, 1898 as the Boston, Milton and Brockton Street Railway Company. It was capitalized at the time in the sum of $80,000 and permission had been granted to increase this amount both as to stocks and bonds as the need arose. Just about this time the city of Boston had completed Blue Hill Avenue, Dorchester through to Mattapan Square and the Boston Elevated was building its line, which up to then had turned into Talbot Avenue, thru to Mattapan Square. 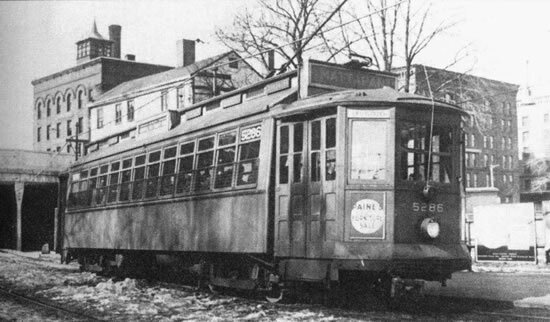 The then Metropolitan Park Commission (predecessor of the MDC) was continuing the broad boulevard through River Street to Mattapan Square and Hyde Park, known as the Norfolk Suburban, the only trolley line anywhere near Milton (except the Dorchester Avenue line to Milton Car Barn so called). The B M & B built their line from Mattapan Square with connection to the Norfolk Suburban on River Street and also connected with the Boston Elevated tracks on the other side of River Street. Some consideration was given to the laying of tracks in the centre of the reservation all the way out the Blue Hill Parkway, but this was never done. The line turned left and ran along the centre of Brook Road, (double track) until it came to Kerrigan’s Corner where it was joined by the line coming up Central Avenue from the Lower Mills. It then traveled along White Street and Reedsdale Road to Randolph Avenue where the Lower Mills line continued to East Milton via Pleasant Street and Edge Hill Road. 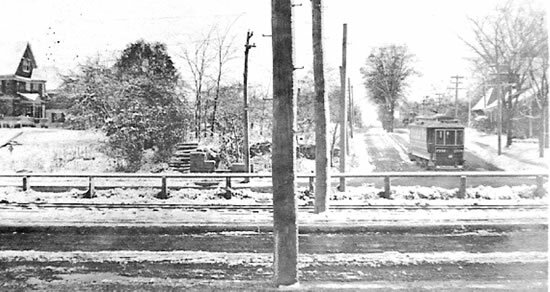 The Randolph Avenue line then became single track in the centre of the road to Highland Street where it swung off to the left and operated on the side of the road until reaching Tucker Hill where it again came to the centre of the road. The single track continued thus until reaching the Milton Quincy Line just beyond Border Road where it again went to the left onside of the road private right of way. 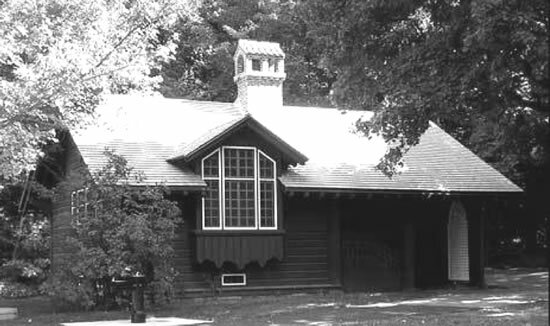 The car barn was erected in 1898 on a plot of land just beyond the Milton Library opposite Meredith Circle, and interestingly enough a present dwelling house which was formerly the waiting room is still standing. 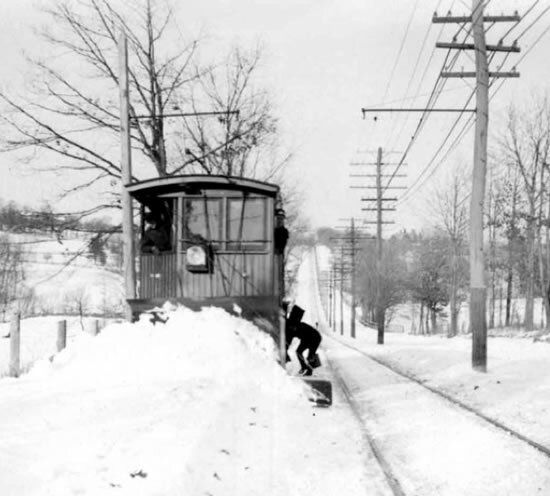 The line was opened to service July 11, 1899. In 1900 an organization known as the Massachusetts Electric Company formed a gigantic consolidation of a number of street railways and power companies north and south of Boston. Reedsdale Rd. car barn with waiting station built by J. H. Burt & Co.
Street Railway; while on the South, with the Brockton Street Railway as a nucleus, the amalgamation was called the Old Colony Street Railway. Among other companies the B M & B was taken over. The trackage of the original B M & B continued in operation until mid 1928 when the Milton Lower Mills-East Milton line was abandoned in favor of busses due to the construction of the rapid transit line through the village which necessitated a change in the width of Eliot Street. The Mattapan to Brockton line continued in operation until July of 1930 when abandonment of the cars occurred due to the widening and rebuilding of Route 28 as we [in 1954] know it. 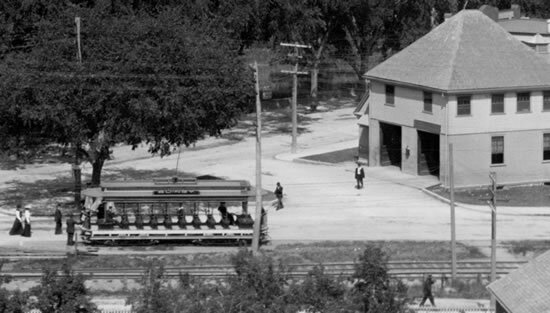 During the 30 years of trolley operation many types of cars were operated. Open and closed cars, trolley freight cars and until September of 1917 a daily trip from Post Office Square in Boston to Providence via Brockton and Taunton to connect with the New York Boats. Another street railway traversing the highways of Milton was the Blue Hill Street Railway. This concern was franchised in 1899 to operate from Mattapan Square to Canton and Stoughton. The building of this road was “in” rather than “out” since it extended from Stoughton Square through Cobb’s Corner in Canton and straight through Blue Hill Avenue. 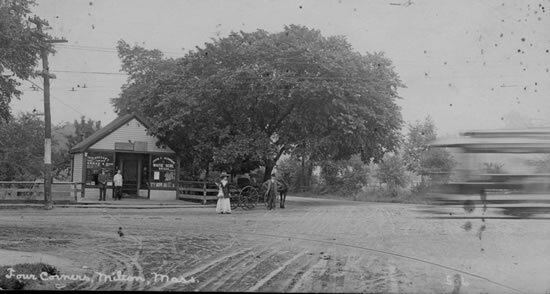 A branch line ran up to the Canton Junction Station and although the original terminus was at the foot of Great Blue Hill, the refreshment stand set back from the road was the car station waiting room and is still standing. 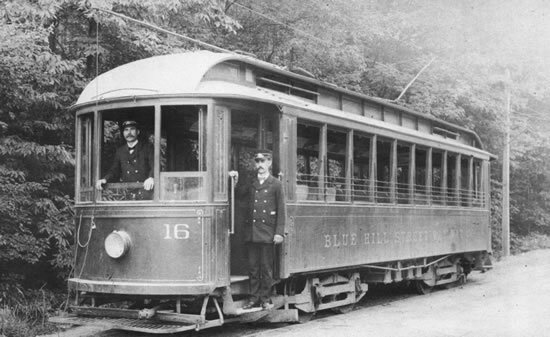 A corporation was formed and later absorbed by the Blue Hill Company called the Milton Street Railway. This organization constructed the rest of the line to the junction of Blue Hill Avenue and Blue Hills Parkway where trackage rights over the Old Colony were used to reach Mattapan Square. Another branch line, although seldom used turned off at the Parkway and went over Paul’s Bridge to Walcott Square in Readville. This company was controlled and operated by the Stone and Webster organization and suffered a great many set backs and financial difficulties. At least two fires, which destroyed rolling stock, and insufficient patronage plagued its owners. It succumbed completely in January of 1920 in a blizzard of tremendous intensity. Such cars as were buried in the drifts were hauled back to the car house in Canton and shortly thereafter the line was dismantled by junk dealers. All that remains in Milton today is the M.T.A. high speed trolley line which runs on the roadbed of the original Shawmut Branch of the New Haven Railroad, entering Milton over the Neponset River below Walter Baker’s, and leaving over the river to enter a terminal in Mattapan. NOTE: Dr. Lunt credited streetcar enthusiast Edward J. Barry for providing much of the research for his article.